Canadian Music Week is almost upon us, so we thought it would be fitting to do a bit of a preview of one of the bands taking part in the event. Still Life Still, hail from East York, and with their upbringing based firmly in Toronto’s live music scene they are a tried and tested inclusion for CMW. The question is, will they grace audiences this year with any new material? 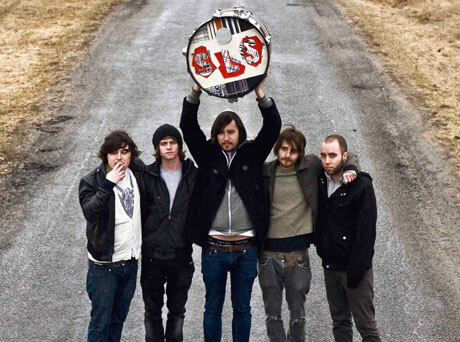 Their most recent release is their debut album, 2009’s ‘Girls Come Too ’. Recorded live off the floor, the album showcases Still Life Still’s electro-tinged, airy, fuzzy brand of indie-pop. Do a quick search on the net and you will discover comparisons are drawn repeatedly between the band’s sound and Broken Social Scene. Funnily enough, Kevin Drew did have a hand in recording and mixing this album. ‘Girls Come Too’ showcases Still Life Still’s fundamental dichotomy: against a backdrop of pretty, soft, experimental rock is juxtaposed overtly sexually drenched lyrics. The contradiction between the ambient indie jams and the blatantly crude eroticism seems like the band is either trying to pretty-up their lyrics with the help of their sound, or give more edge and male credibility to their emotionally evocative music through their brazen lyrics. Either way it makes the band memorable; it makes their music stand out. The danceable beats of ‘Danse Cave’, the slow subtlety of ‘Kid’ and cute pop of ‘Wild Bees’ also prove the band can write memorable compositions. There have been rumours about a new Still Life Still recording in the works, so it will be interesting to see if the band’s CMW appearance at The Horseshoe on March 10 will feature some new treats. One thing is for sure, this band has a reputation for great live shows, and their experimental indie jams featured on ‘Girls Come Too’ take on a whole new dimension in a live atmosphere. Get down to The Horseshoe Tavern on Thursday, March 10 for a special extended hours CMW showcase, featuring Still Life Still, along with The Wilderness, Rich Aucoin, Zeus, Memphis, Molly Rankin and Modern Superstitions.